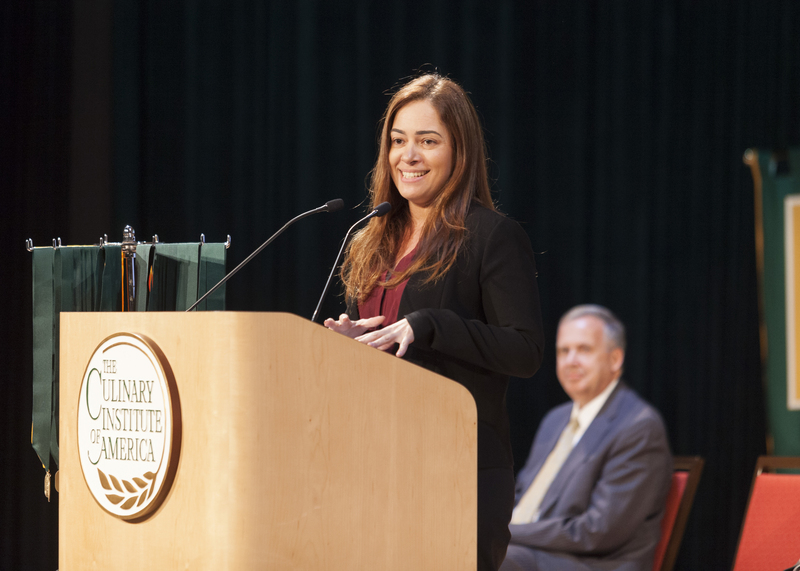 Hyde Park, NY – Christine Assouad Sfeir, CEO of two major Middle East restaurant companies, spoke to graduates at the New York campus of The Culinary Institute of America on October 16. Ms. Sfeir heads Treats Holdings SAL and Meeting Point, both based in Beirut, Lebanon. Treats Holdings includes 40 Semsom restaurants in the Middle East and New York City and a new chain in Lebanon and Saudi Arabia called Green Falafel. Meeting Point is the franchisee of 25 Dunkin’ Donuts outlets in Lebanon. She was ranked 19th on the Forbes magazine list of the Most Powerful Arab Women last year, and for the past three years, Ms. Sfeir has been named one of Arabian Business magazine’s 100 Most Powerful Arab Women. She was honored as Businesswoman of the Year at the 2011 Arabian Business Achievement Awards. Ms. Sfeir spoke to 61 associate degree graduates in culinary arts and baking and pastry arts at the CIA. The entire graduation ceremony can be seen online.